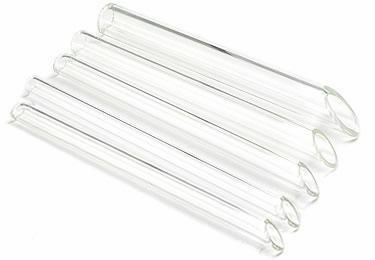 Perform piercing procedures safely with these Pyrex Glass Receiving Tubes. These receiving tubes measure 3” in length and have a 45º degree angle on one end; they are a flat 90º on the other end. Please refer to the size chart below for information about the inner diameter for every size included in your pouch of 5 tubes. This listing is for one set of 5 Pyrex Glass Receiving Tubes, including one 6g, one 4g, one 2g, one 1g, and one 0g tube. These 5 tubes come in a velvet zipper pouch.